In November of 2013 we interviewed Haley Hewitt who had just won the Scottish Harp National Championship. EDITOR’S NOTE: In this issue of the Celtic Guide, we interview harpist Haley Hewitt, crowned as National Champion of the Scottish Harp Society of America this past September. It’s been a busy time for Haley, having just founded the Connecticut Harp Circle, this October. The group is set to meet monthly in New Haven - basically an opportunity for the local harp playing community to get together and get to know each other and how much fun it is to play with other harp folks! Also, in October, Haley participated as a composer in the Whaling City Film Project, in which the team had to script, score, film, and edit a short film in four days. “I had a blast working collaboratively on it and am very proud of the results!,” states Hewitt. Just a short time ago, September 21st to be exact, the Scottish Harp Society of America, in conjunction with Clan Currie, presented a harp competition at the famous Ligonier Highland Games at which Haley Hewitt of Connecticut, was chosen the 2013 U.S. National Scottish Harp Champion of America. Ligonier is located about 60 miles southeast of Pittsburgh, PA. This area was home to most of the first Scottish Irish frontiers people to cross over the Allegheny Mountains, in the early to mid 1700s. Nearby Ligonier are Derry and Donegal, highlighting the Celtic influence that runs through this rugged, beautiful countryside. For over 50 years, the Ligonier Games have entertained local and regional Celts and wannabe Celts. For over 40 years, the Scottish Harp Society of America has been dedicated to the Scottish harp, the clarsach, and its music, ancient and new. For over 60 years, Clan Currie has promoted Scottish events throughout North America. Combine these three powerful Scottish-oriented entities and you have a formidable host for an event that saw harpists from a wide area compete for this championship. The event was – and will continue to be – sponsored by the Clan Currie Society, who has entered into a five-year commitment to act as Title Sponsor for the Championships. 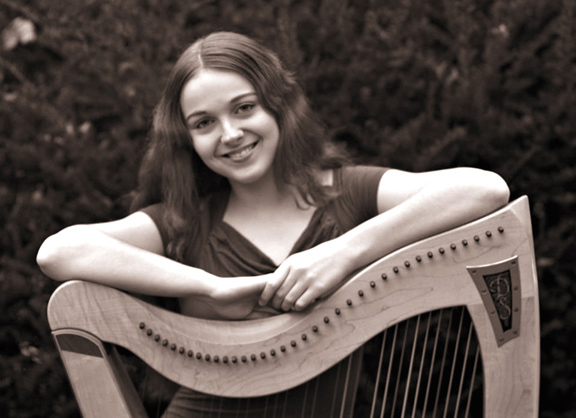 Haley Hewitt is a harpist currently based in Connecticut, this after spending two years in Glasgow, Scotland, obtaining her Master’s degree in Scottish harp! She loves to play ancient and new music and to collaborate with other musicians. She performs on both pedal and lever harp. Her Master’s degree in Scottish Music was earned from the Royal Conservatoire of Scotland where she studied under Corrina Hewat, plus she holds a Bachelor’s Degree in Pedal Harp Performance from the Hartt School of Music, in the studio of Rebecca Flannery. As a pedal harpist she has played in solo, chamber, and orchestral settings extensively, including performances at Carnegie Hall and Benaroya Hall. As a traditional musician, she has presented programs featuring the music of modern Scottish harpers and fiddlers. Haley is a sought-after teacher for pedal harp and lever harp students and is an experienced performer in various public and private engagements. She is well-known as an orchestral musician, a wedding performer, and a concert harpist and offers weekly classes in New Haven, CT and Burlington, CT, where she frequently gives specialist workshops and masterclasses. Hewitt is also a new composing talent, with commissions for film, solo, small ensemble, and large ensemble works. Her original material is featured on her upcoming 2014 debut album. CG: Welcome, Haley, to the pages of the Celtic Guide. CG: Despite the immense popularity of the fiddle and bagpipes, the harp has remained the musical symbol of the Gaelic culture of both Scotland and Ireland. What first attracted you to playing this wonderful instrument? HH: I was first attracted to the shape of the harp, then the sound. By the time I was nine years old, I had been playing piano for a few years. At a music shop in Vermont, I saw a beautiful harp and went straight to it, picking out my piano repertoire. It was love at first sight! It’s a very accessible instrument - for the player, you have an intimate and direct connection to the sound you produce; for the audience, there is a visual connection to the music you are hearing played that most other instruments cannot match. CG: To the non-harp player it seems quite complex to have all of your fingers acting somewhat independently of each other. How were you able to gain the dexterity and syncopation necessary to perform on the harp and win championships? HH: Having piano training from an early age helped me quite a bit, as there are many transferable skills (reading music notation, a basic understanding of music theory, and an already developed ability to play with hands acting independently, etc.) I have practiced a lot over the course of many years, and as almost every musician will tell you, you won’t get far without practicing. However what I found even more valuable and influential was my experiences with sharing music - whether with other musicians or as a performer. You can spend countless hours perfecting your technique, but something deep and vital to music is lost if it is not shared. CG: I am always fascinated by these next two questions. Is there a spiritual element to your performance? And do you find yourself drifting off somewhere in your consciousness, or are you focusing intently on your performance. HH: I am a devoted teacher, and I see performing as another method of teaching. When I play I try my best to share the joy and love I have for the harp, music, and all of life’s experiences. Sometimes I do drift off, and other times I get into the ‘zone’ where everything else disappears and I am at peak focus. Each performance is different, because each audience is different. I do my best to suit what and how I play to whomever is listening. CG: We understand you are now composing your own pieces. Are they Celtic in nature or more orchestral? . . . or both? HH: Good question! It’s always difficult to talk about your own creation. I am certain that to a classical musician my writing sounds ‘traditional,’ and to a folkie it sounds classical. But my influences are drawn from far more than these styles. I have listened to rock music my whole life, and have over the past few years been delving into jazz and indie - it’s inevitable for those sounds to not have influenced me just as much as my academic pursuits. Many years ago I read a quote by George Harrison and I cannot remember the exact words, but the gist of it was: at first he was intimidated by composing until he realized that all the music he has ever heard is still within him and informs all the decisions he makes when writing. I am still very new to composing, but his words have inspired and comforted me to keep trying. CG: Where can our readers find examples of your music? CG: We are sure you are thrilled with your win at Ligonier, and your award of a Master’s degree earned in Scotland. Is there a special award or recognition that leads your list of accomplishments? HH: Awards or recognition are not really why I play, so no I suppose not! I find the proudest moments in my career have been when the music I play or write makes a difference to other people, or when a student is as excited about music as I am. CG: Certainly it must have been a thrill to play Carnegie Hall. Do you have a favorite type of venue at which you like to play? HH: I love smaller audiences so much better. With a huge packed hall, it’s so hard to feel a connection with the listeners that I tend to revert to my perfectionist tendencies and forget about the reason I’m there. However, with a small coffee-house sort of group, you can feel the energy from the room. That feedback is so important to the decisions I make on-stage. Music is about making connections with people, and that’s so easily lost in a huge auditorium. CG: What about studio work . . . does that bring something different out of you musically than performing a live performance, or is the opposite true? HH: I’m comparatively new to the studio, but it has been such a great experience for me every step of the way. I used to be so terrified of recording myself (that perfectionism tendency again!) that I would feel paralyzed. But my teacher Corrina Hewat, a very accomplished recording artist and phenomenal musician, encouraged me to explore recording. The experience in a studio is indeed very different from playing live, and I try to capture that same energy that a performance has. The main advantage I see to studio time is that you are more able to get the music the way it sounds in your head. CG: How did you like living in Scotland? Did you travel the countryside and find that special place that felt like home? HH: I adored living in Scotland! I found the people to be warm and friendly, welcoming me at every opportunity. Moving to Glasgow was quite an adjustment for me because until then I had lived in the comparative countryside. I was able to explore a good chunk of the country, escaping the city as often as I could. It fascinated me how the land is soaked with tradition, nearly each river, mountain, and field having a story and a song. My favorite place was the Isle of Skye, and I would love to visit again. CG: Is there something in particular you’d like the readers of Celtic Guide to know about Haley Hewitt? HH: To beginning harpists and musicians - keep playing for the joy of it! If you have that, everything else will follow. To other musicians in my area, I would love to collaborate and am always looking for a new project. To my past teachers, thank you for helping me learn how to listen. CG: Thank you so much for sharing your thoughts with us, Haley.